Sue was not a snorer, but David on the other side of the (thinnish) wall was. Mainly, though, the night was disturbed by the inevitable consequences of the passenger complement being Baby Boomers-plus, with all the bladder issues that that involves (it's a communal loo). No matter. We woke to a cloudy pre-dawn – the sun gets up around 8.15am hereabouts, this time of year – and a departure from the North Arm of Port Pegasus along the inside passage to Shipbuilder’s Cove. Just as we arrived, we were being diverted by some sea lion activity in the water when there was a sudden loud scraping sound, a lurch that sent everyone staggering, and an abrupt stop. We’d run aground! On a rock, of which Stewart Island has many, and which all that fancy modern instrumentation apparently can only register once it’s below the ship, not directly in front. Which to me seems to be a bit of an operational disadvantage (especially since it transpired that this particular rock is uncharted by Maritime NZ despite having snared at least five vessels before us). However. There was a long silence, some staff flurry, and then a sombre apology from the captain, for whom it was clearly suddenly his worst ever day. 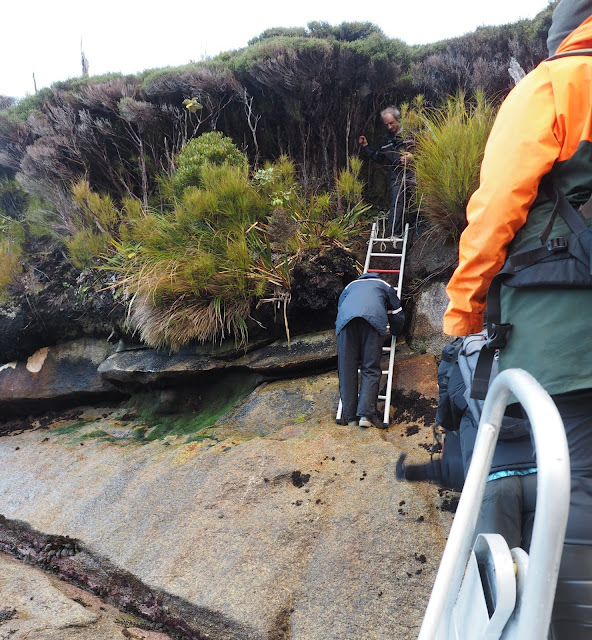 While they got on with checking for leaks and making arrangements for further inspection, we carried on with the plan for the day, which was to climb up Bald Cone. Richard assured us that, while steepish, it was do-able, and so most of us piled into the tender to go ashore. I say “ashore” because it was technically true – but it was more of an assault. What we had to do was to step out of the tender onto a ladder propped onto a rock, and climb up it, thence to scramble up through dense bush over treacherously slippery ground. Prickly stuff in the face, feet slipping underneath, the gradient so steep it was more a matter of hauling up it rather than climbing – it was kind of shockingly challenging. And so it continued, on up through the bush and then out onto an area of burn-out, the consequence, it was darkly suspected, of careless firework indulgence (unlikely as it seemed in such a remote area – evidence had been found). This meant clearer ground, but the remains of the bush were sooty, spiky snags, and underneath the soil was if anything even wetter and slipperier. We struggled up this for a while, stopping now and then to admire the ever-improving views of bare granite outcrops and precariously-balanced boulders, of green hills and distant bays, all set off by sweeping clouds of rain, shafts of sunlight brightening the colours, and rainbows. Then we got to the granite rocks, which were, as Richard said, “grippy” (the other conditions of the day were “slippy” and “steppy”) and after just an hour we were on the top, enjoying both our morning tea and the spectacular views. And trying not to think about the return downhill. It was, as feared, as treacherous and difficult as we expected, and most of us had at least one dramatic slither – but it was quicker, too, and soon we were back at the bottom where the Milford Wanderer was waiting for us, now thanks to the higher tide floating freely, but busy with divers who had been helicoptered in. They found nothing to concern them, but sadly the official boringly responsible Real Journeys decision was that no chances should be taken, and so we were to be returned to Oban in a hired catamaran to spend the night in hotels. Cue much disappointment, dismay and discontent as we returned to our cabins to pack up. There was even some defiance, but it was professionally quelled. And so we spent a couple of hours bouncing back along the coast in the dully conventional catamaran, our adventure seemingly at an end. 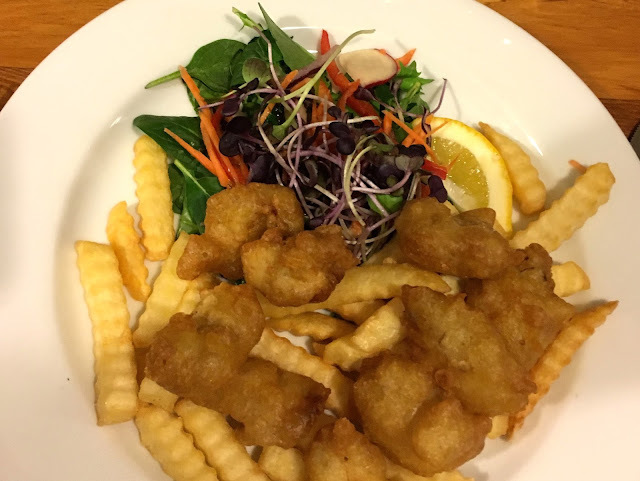 Once settled, however, into our various hotels in little Oban (our arrival boosted the island’s population by 10%) and reassembled at the South Sea Hotel for dinner, with an open bar tab provided by the company, people began to cheer up again. Free wine and, especially, Bluff oysters will do that, especially when the entrée three turns out to be four, and the mains six is actually nine. 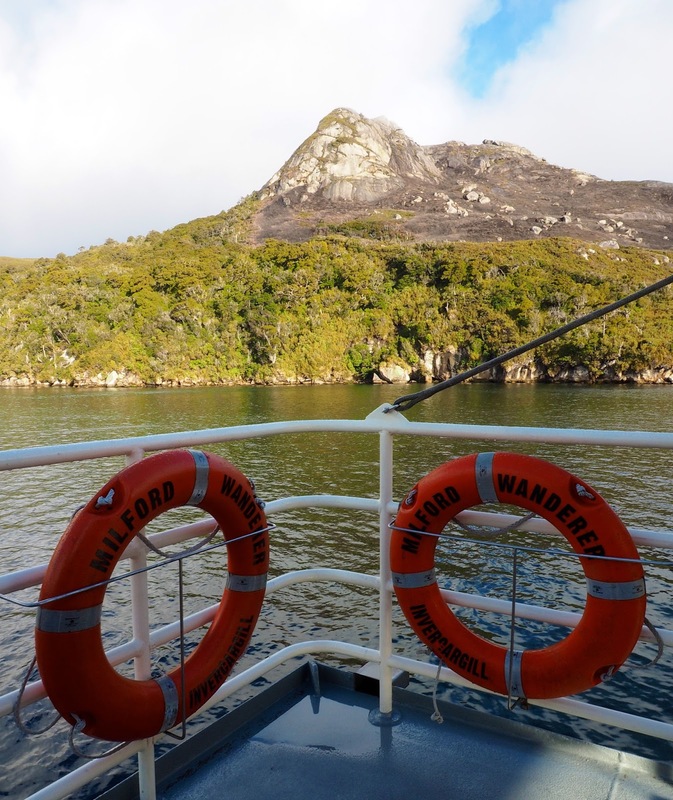 Even better, we were given real hope that, after inspection tomorrow by Maritime NZ who wouldn’t even consider our remaining aboard until they had done their job, we may yet be able to return to our cabins and a version of the original itinerary. So the day ended in good cheer, with lots of jokes about shipwrecks, compensatory tots of whisky “on the rocks”, being evacuees, and worse things happening at sea. There was animated conversation, from bedsocks to the Treaty of Waitangi via poetry and Machu Picchu; there was singing; and there was noticeable gelling of the group. In the end, the agreed rating for the day, running aground notwithstanding, was 8/10. Not bad, considering.